When he heard her cry out so piteously he was very sorry for her,and ran back into his house to fetch a long boat-hook. 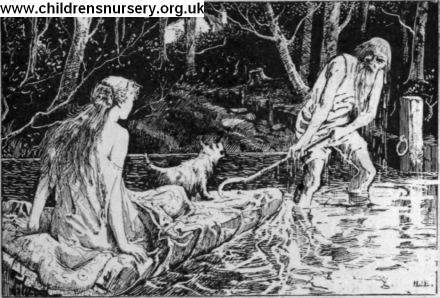 Then he waded into the water up to his chin, and after being nearly drowned once or twice he at last succeeded in getting hold of the Princess's bed and dragging it on shore. shoes, which the Princess put on, and thus roughly clad looked as charming as possible, and Frisk danced his very best to amuse her. The old man saw that Eosette must be some great lady, for her bed coverings were all of satin and gold. He begged that she would tell him all her history, as she might safely trust him. The Princess told him everything, weeping bitterly again at the thought that it was by the King's orders that she had been thrown over­board.